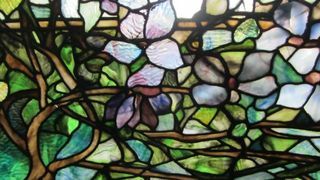 IN THE SUMMER OF 1888, Clara Wolcott, a daring young artist from Ohio, walked into Louis Tiffany's Manhattan office to interview for a job as a designer. For the next 21 years, her pivotal role in his multi-million dollar empire rmained one of Tiffany's most closely guarded secretes—a secret that when revealed 118 years later, sent the international art world into a tailspin. Basing her story on recently discovered letters written between 1888 and 1944, New York Times bestselling author Echo Heron artfully blends fact with fiction to draw the reader into the remarkable life of one of America's most prolific and extraordinary women artists: Clara Wolcott Driscoll, the hidden genius behind the iconic Tiffany lamps. FOR MOST OF MY WRITING LIFE I have endeavored to champion extraordinary women who unjustly go unrecognized simply because they are women. In January of 2007, I heard an NPR broadcast about the discovery of a large volume of letters written between 1853 and the 1940's that proved beyond a doubt that the true designer of the iconic Tiffany lamps was not Louis Comfort Tiffany, but rather, Clara Wolcott, a young artist out of rural Ohio. The story grabbed me and would not let go. Thus began my six years of intensive research into the life and times of Clara. By the time I had finished reading Clara's letters, in which she gives vivid accounts of her daily life in turn-of-the-century New York City, I felt I had to bring this remarkable woman out from behind Tiffany's shadow and into her own light. If you will, take a closer look at the book cover. The pensive woman in the photograph of Clara. I think after all these years of silence, she would be honored for you to read her story. And please write a review!